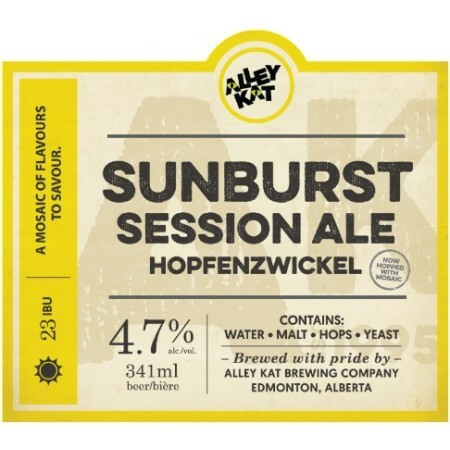 EDMONTON, AB – Alley Kat Brewing has announced details that a summer seasonal brand that made its debut last year will be returning for another run later this week. Our Sunburst Session Ale is the colour of a hazy summer’s sun and tastes of bright citrus, blueberry, and mango. Hints of lime and pine balance these juicy tropical flavours to create an easy-drinking and refreshing ale. Complimented by Mosaic and Centennial hops, this brew will transport you to a lazy summer afternoon… even if there’s still a little snow on the ground. This year’s version of Sunburst Session Ale will be released on Thursday March 29th, and will be available in 6-packs of 341 ml bottles at select liquor stores in Alberta, and on tap at better beer bars in the province.